At 3 to 4 weeks of age, kittens are becoming big boys and girls, and it's time to initiate the first stage of the transition from their all-milk diet. Don't expect much the first time you plunk that dish of solid food on the floor within the reach of hungry kitties. They'll have to scrutinize the delightful new toy closely. They'll sniff it, walk in it, play and wrestle in it and end up wearing more chow than they eat rather than slurping some of it down. If the kittens had their druthers, they would feed on their mama indefinitely, much to the chagrin of the queen. She will continue nursing them for several more weeks as she gradually increases her time away from the litter until she completely weans them at around 8 weeks of age. Feeding the kitties all the solids they'll eat after the kittens are 3 weeks old complements Mama's efforts nicely. Offer canned kitten food or dampen a handful of dry kibble with warm water in a shallow pan and prepare to be entertained. Because cats don't have as strong a thirst drive as most other mammals, you'll have to go into overkill mode to convince them to lap samples from that strange new water dish. 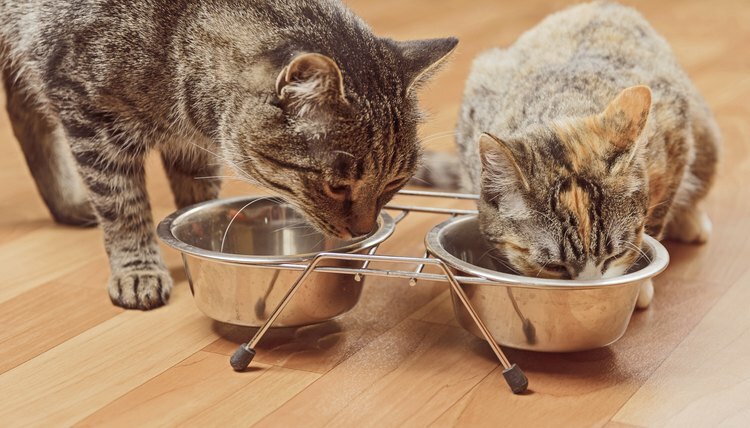 Set shallow bowls of clean, fresh water in numerous locations convenient to the little guys and keep this crucial nutrient available to them around the clock. Cat Channel: When Are Kittens Ready for Softened Cat Food?